I went to the match against Oldham Athletic full of hope and anticipation that we would see the same team effort that had been eminent in the past two away matches – the first ray of hope was that our manager Gabriele Cioffi had picked the same side that fought so well at Bury. It was a disappointing turn out by the Crawley public but you have to say that most don’t see the away performances and only have the last home match to go by – once they start winning the home games, we might see the home attendances improving. On the eve of the match, manager less Oldham had been given approval by the FA to appoint former Manchester United and England international Paul Scholes, so it was the visitors who had something to fight for, to impress the new manager. The first half Crawley and Oldham huffed and puffed with Glenn Morris being the busier of the two keepers, the Red Devils lacked that trigger to get them going and the first half petered out in stalemate. In the second half we saw Oldham take the initiative and upped their game, saying that, a long ball by Morris found Ollie Palmer and his first time strike beat the keeper and narrowly pass the post which could have inspired the home side on. New signing Matty Willock was brought on for Josh Payne and despite a couple of neat touches couldn’t help find that spark. Immediately following that chance, Oldham were award a free kick just outside the penalty area. The Crawley wall lined up and Morris ready. You won’t see a better free kick outside of the Premier, Branger-Engone’s free kick was brilliant and no keeper would have got near it, let alone save it, you just had to take it on the chin and say well done. 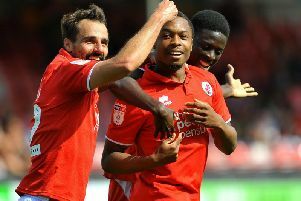 Crawley were now on the back foot, still trying to find that elusive spark to get them back into the game – it just wouldn’t come. Oldham scored from two late breakaways when Crawley were attacking leaving limited defensive cover, a couple of missed place passes by both wing backs David Sesay and Lewis Young gave the visitors a score line that flattered them as the game came to a close. Both goals were well taken and Glenn Morris had no real chance of saving either of them, especially the last when Gevaro Nepomuceno fired into the top corner from just inside the penalty area. It was just one of those days when the visitors just had that little bit extra – we go again next Saturday at Northampton – but I must admit was bitterly disappointed with the overall performance. Details for next two away games: Next Saturday 16th February we travel to Northampton Town for another league game with a 3.00pm kick off - Our coach to this match is now FULL. If anyone is driving to Northampton who has spare seats, please let us know so we can put anyone on our standby list in contact so they have a chance to get to the game. On Saturday March 2, we travel to MK Dons for a league game with a 3.00pm kick off – we depart from the PP Stadium at 10.00am and have organised a buffet stop again. Cost for this trip is £20.00. Again we are taking bookings now for this trip so please contact us on 07771-792346 – This coach is already half full.